CARRBORO – After a multi-year groundbreaking delay, 300 East Main is back on track and staying on schedule, with completion of the project’s first phase slated for May. Construction of the downtown development began in March, but the long-awaited groundbreaking was several years in the making, with the Carrboro Board of Aldermen giving their stamp of approval in 2008. The massive project includes the redevelopment of properties extending from the intersection of Main and Boyd streets near Nice Price Books to the municipal parking lot on the corner of Main and Roberson streets. Construction is underway on the first phase of the project, which includes a 142-room Hampton Inn and Suites – Carrboro’s first hotel – and a 500-space, six-level parking deck, also the first of its kind in town. The hotel building will include 18,100 square feet of retail/restaurant space on the ground floor, room for six to nine tenants. Additional phases of the project will include a five-story retail and office space near the train tracks and redevelopment of the building that houses Cat’s Cradle, Fleet Feet and Amante Gourmet Pizza. 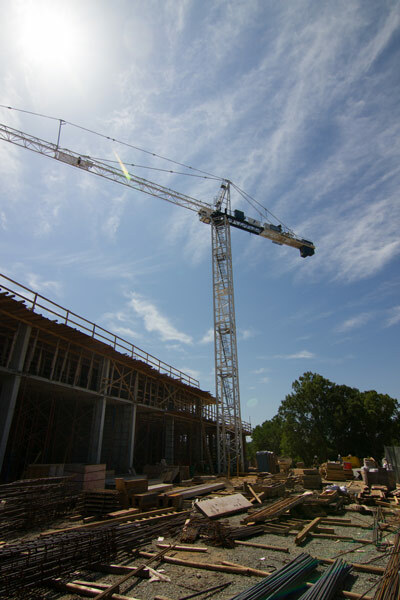 Van Sant said the crane will likely remain on the construction site through September, when work will begin on the hotel interior and construction of the parking deck will start. “The deck is a lot quicker to build,” she said, adding that completion of both the hotel and parking deck is estimated for early May.